This article is part of a combined publication that expresses the current view of the European Society of Gastrointestinal Endoscopy about endoscopic biliary stenting. The present Clinical Guideline describes short-term and long-term results of biliary stenting depending on indications and stent models; it makes recommendations on when, how, and with which stent to perform biliary drainage in most common clinical settings, including in patients with a potentially resectable malignant biliary obstruction and in those who require palliative drainage of common bile duct or hilar strictures. Treatment of benign conditions (strictures related to chronic pancreatitis, liver transplantation, or cholecystectomy, and leaks and failed biliary stone extraction) and management of complications (including stent revision) are also discussed. A two-page executive summary of evidence statements and recommendations is provided. A separate Technology Review describes the models of biliary stents available and the stenting techniques, including advanced techniques such as insertion of multiple plastic stents, drainage of hilar strictures, retrieval of migrated stents and combined stenting in malignant biliary and duodenal obstructions. 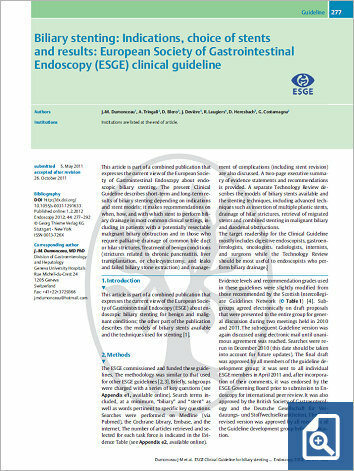 The target readership for the Clinical Guideline mostly includes digestive endoscopists, gastroenterologists, oncologists, radiologists, internists, and surgeons while the Technology Review should be most useful to endoscopists who perform biliary drainage.